Reebok is recalling 145,000 bracelets in the UK and Ireland amid fears that high levels of lead in the gift may have killed a child in the US. A four-year-old boy in Minneapolis died from lead poisoning after swallowing one of the bracelets. The silver coloured, heart-shaped charm jewellery was given away with its Children's Reebok Classic footwear since December 2004. Reebok warned that the gift must be immediately taken away from children. "Reebok is aware of the death from lead poisoning of a child who has reportedly swallowed a piece from one of these bracelets," the firm said. "This voluntary recall is being conducted because the bracelet may contain high levels of lead." Reebok, which recently merged with Adidas, said anxious parents should call its hotline number on 0800 305 050. 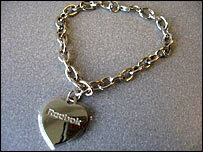 The bracelets were produced by a contractor in China, and according to a US health official, are 99% lead. Minnesota Department of Health official Harry F. Hull told the St. Paul Pioneer Press that the boy's death was a tragic case. "This is the first time, at least in recent times, that a child has died like this from ingesting a charm." He said the fatal element was that the charm was too large to pass through the child's small stomach, where it lodged and dissolved in stomach acid over several days. Reebok said it learnt of the boy's death from Minnesota health authorities on 10 March and began notifying retailers three days later to stop distributing the bracelets. It is recalling 300,000 of them in the US. Mr Hull warned parents to keep metallic jewellery away from all pre-school children as US company Dollar Tree Corporation announced it was recalling nearly 600,000 pieces of jewellery over similar lead-poisoning fears.